The 5th Kazekage known as Gaara was standing within the forest of death in Konoha. It was a rainy day and the night was young. The only source of light in the forest of death were the rays from the moon, and most of them ended up being blocked off the over sized trees. 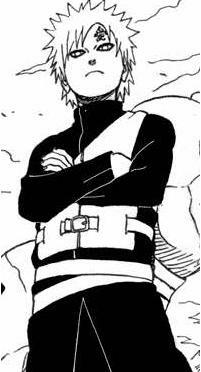 With his arms crossed, Gaara is stairing at his opponent, the one know as the 2nd hokage. Now saying a single word, the corck on his gorge pop off in the dirrection of the 2nd. Within seconds sand slowly started to fall out of the gorge and around Gaara, as he got prepared for battle. The man known world wide as the 2nd Hokage stood in front of the youngster, also known world wide, but as the 5th Kazekage. One, a master of water, and the other, a master of sand. The stage was set for an epic confrontation. Rain splashed down all aroudn the two of them as they stood in the Forest of Death. "I don't know who you are, but I will not go easy on you, youngster." the 2nd said. His hands flew together into a single seal, and the next second, water burst up all around him. It swirled up into the air and began forming into something. The rain drops falling around them seemed to get absorbed into the mixture, creating an even larger mass of water. "Suiton! Water Dragon no jutsu!" 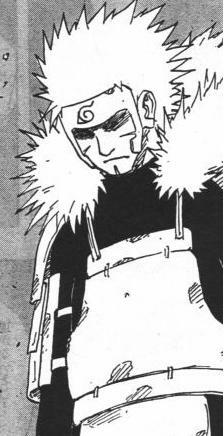 the white haired man roared as he thrusted a fist forward at Gaara. The scary mass of water suddenly formed into a serpentine dragon the size of the one from Dragonball. It released a roar that shook the earth that Gaara stood on before flying down at him full speed.